As the year comes to an end, we’re sharing helpful lists to help you save money, stay healthy, get organized, creatively repurpose, frugally gift-give, intentionally celebrate and more in our seasonal updates throughout these holiday months. 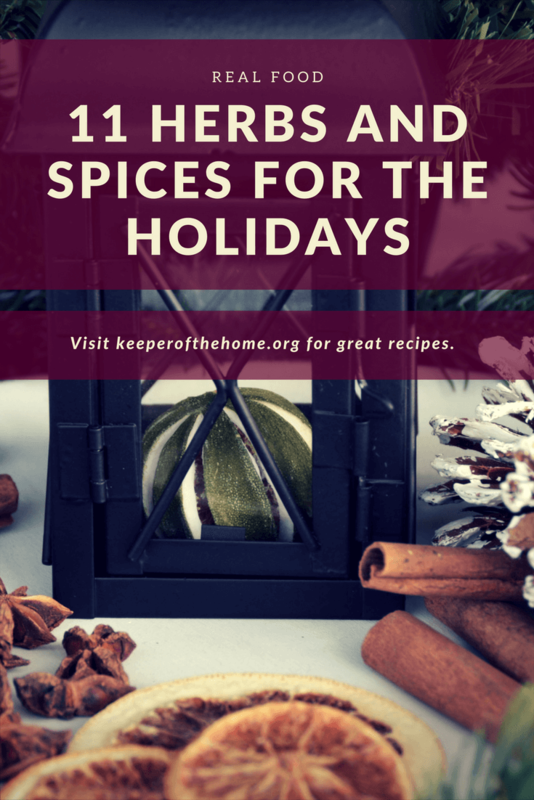 We are excited to share our favorite herbs and spices for the holidays. 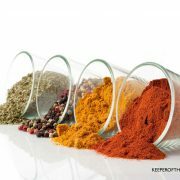 The holidays are a wonderful time to enjoy herbs and spices. There are so many opportunities to use them in baking and cooking as well as medicinally. Cinnamon is the champion spice of the holidays. It seems to be everywhere: in baked goods, applesauce, warm drinks and even ornaments! 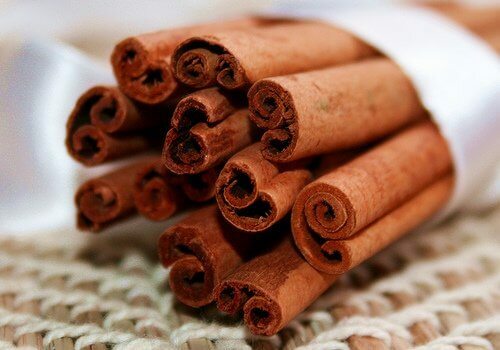 Besides these popular uses, cinnamon is helpful in alleviating indigestion and nausea. To make cinnamon tea, simmer three or four cinnamon sticks in two cups of water. Sweeten with honey, if desired. The little spiky, hard cloves that come out of our spice jars are actually dried buds of the clove plant. The sharp end of the clove bud is excellent for studding the outside of a ham. 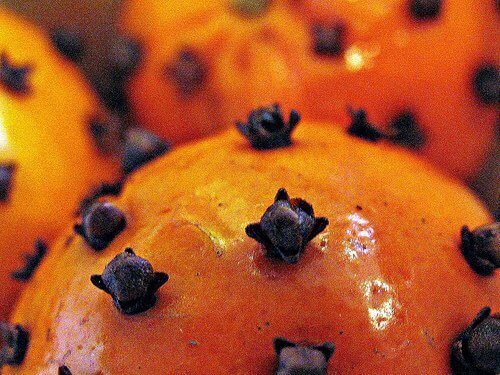 Clove-studded oranges are also easy and can be included in a pot of mulled cider or used decoratively. Chewing on a clove will take care of bad breath, too! Nutmeg is another favorite holiday spice often used in cakes and pies. It is also a great digestive aid. To settle the stomach, add a small pinch of nutmeg to a cup of ginger tea. (Only use nutmeg in small doses. It can be toxic if taken in large amounts). A glass of warm milk sprinkled with ground nutmeg is a relaxing bedtime drink. We use this when our kids are restless, to help them settle down and go to sleep. A nutmeg-milk nightcap is perfect for when holiday excitement is keeping everyone awake. Tip: One whole nutmeg is equal to 2 to 3 teaspoons of ground nutmeg. Ginger adds warmth and interest to a variety of foods. It also has many wonderful medicinal uses such as increasing circulation, reducing inflammation, and relieving congestion, nausea, gas, and chills. To make ginger tea: steep 1 to 2 teaspoons of freshly grated ginger root or ½ teaspoon of powdered ginger in 1 cup of boiling water for about 10 minutes. Rosemary is a delicious culinary herb that is often used in roasts, soups, and stews. It contains many wonderful health benefits such as rejuvenating the hair and skin, reducing headaches, and acting as a mild diuretic. Rosemary is excellent with roasted chicken or glazed ham. Did you know you can add shine to your hair by rinsing with an infusion of rosemary? It’s easy (and it works). 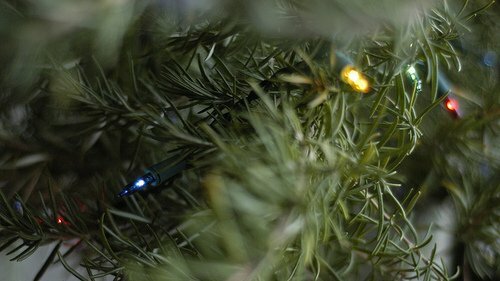 A small, potted rosemary bush makes a lovely little Christmas tree or fragrant centerpiece. Highly prized for thousands of years, Sage contains many healing properties. It is an excellent anti-inflammatory and helpful in reducing irritations of the stomach and intestines. Sage is also thought to be a great memory booster and is one of the most effective treatments for a sore throat. Turkey Sausage – my family loves this and eats it often. I make it in bulk and freeze it. Growing up in Australia, we often ate minted peas with our roast dinners. While I never cared much for the flavors or mint and peas combined, I have since learned just how beneficial mint can be. Peppermint is especially helpful during the holidays since it stimulates digestion and relieves heartburn. An after-dinner mint, made with real peppermint extract, is a good way to finish a meal. Alternately, a cup of freshly brewed mint tea will get the digestive juices going. Peppermint also alleviates headaches (which can become frequent during the holidays if we are not careful). Rub a drop of peppermint essential oil onto the temples to help soothe an aching head. Since the holiday season takes place during the winter months and we often find ourselves in confined spaces with lots of people, it is wise to build the immune system by taking astragalus regularly. Astragalus can be taken as a tea, tincture or in a capsule. The dried root can also be chopped and included in soups and stews. I heartily encourage you to add this herb to your families repertoire (if it is not there already). Studies are proving that astragalus reduces the frequency and duration of cold and flu. With all the activity of the holidays, it is likely we will get a cold at some point. To lessen symptoms and speed recovery, start taking echinacea as soon as you feel ill, but not before (it has been shown that echinacea is not overly effective as a preventative, but is best used to treat acute illness). Now is an excellent time to make your own echinacea tincture. 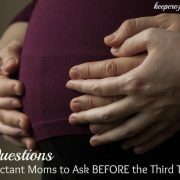 It is very easy but does have to sit for a few weeks. Starting a batch now will ensure you have some ready during the holiday season. 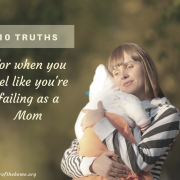 I’m including lavender on this list because of its ability to reduce stress. It is also a lovely addition to gifts of homemade body care. To reduce stress, drop one or two drops of lavender essential oil on a tissue and inhale when needed. To infuse your home with a lavender fragrance, add three to five drops of lavender essential oil to a small amount of water in an oil diffuser. Chamomile is well-known for its calming properties. The holiday season is the perfect time to put chamomile to work. When the days get longer and you feel tired or stressed, sitting down with a cup of chamomile tea before bed will help you relax and unwind. 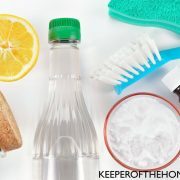 To help the entire family settle down, spray this homemade calming room spray throughout the house or diffuse a few drops of chamomile essential oil in an oil burner. Chamomile is also frequently included in homemade body care. Gifts made with chamomile are perfect for those who need a little relaxation and pampering. God has created such wonderful herbs for us to enjoy. He not only made them flavorful but also medicinal. The above eleven herbs are just a small selection of what He has abundantly blessed us with. What are your favorite herbs and spices? How do you use them during the holidays? @Wick, I’ve never tried that. Do you sprinkle ground nutmeg around or use it whole? I’d never even heard of astragalus—neat! Thank you! @Stephanie @ Keeper of the Home, I often forget about ginger,too. I’m always worried it will be overly spicy. But if often really enhances other spices in fall/Christmas baking. And rosemary . . . I just love it! Love the rustic look of a rosemary plant, love the smell, love how easy it is to grow! Rosemary works great with some baked potatoes and yams as well! Love it! Wow! Thanks for this great post! It’s absolutely packed with good information and you’ve totally inspired me to take a tour through my spice cabinet. I think we need a few additions! Thanks so much for this comprehensive list! 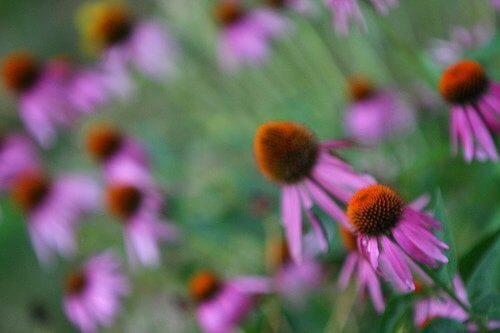 I was surprised to read about echinacea, but I’m glad I know that now! 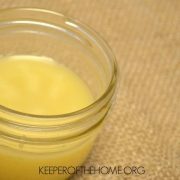 I have been giving it to my girls every day for their immune system! I guess I can back off! I put 3 cinnamon sticks, 3-4 cloves and left over orange peel (about half of an orange)in two cups of water (I call this “Christmas Brew”). Let this Christmas Brew simmer on your stove all day the smell is amazing. I start doing this the day after Thanksgiving. It really gets me in the Christmas mood. You can adjust the ingredients to your liking..this is what I use. 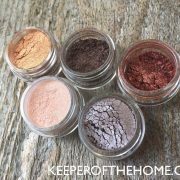 Thanks for a great blog post and fueling ideas for homemade Christmas gifting! I put our decorative bowls of fresh rosemary. It smells great and acts as a natural air freshener. It will act as a great barrier to negative energies entering your home at this time. Or if you have had a visit from your Great Aunt Hagatha who is such a negative person, and is always gossiping. Make sure one of these little bowls is near her during her visit. It will help to counter her personality and perhaps make her visit a bit more bearable. Thanks for the post Linda! This is very helpful information. I didn’t know fresh rosemary was good for countering a person’s negativity. Does it work with dried as well?